Just recently this May Make Up For Ever launched their new Aqua Liners. I've been meaning to try them out for while, but just couldn't decide what colors I wanted. 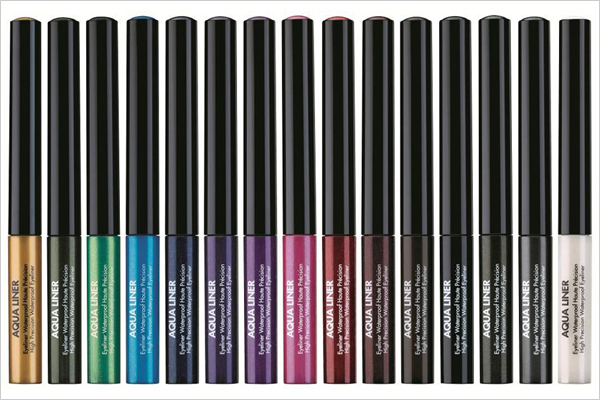 These new aqua liners come in 15 vibrant shades that vary from matte, iridescent or diamond finishes. I contacted Make Up Forever to learn a little bit more about their new liners. These aqua liners were created to provide make up artists with the ultimate in liquid liner. A liner that would boast precision, be 100% waterproof and come in a variety of colors. They did exactly that. These liners were introduced during Mercedes-Benz Fashion Week Swim in Miami and they were an instant hit. 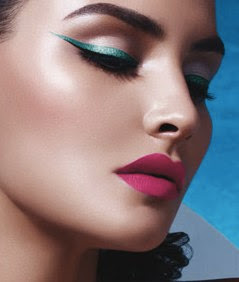 The challenge was to create a look (using these liners) that was bold, show-stopping, and wouldn't melt away under the hot lights, Miami climate or in water. The result proved that aqua liner is guaranteed to wear through intense weather. Aqua Liner is formulated with acrylic copolymer. Acrylic copolymer is a macromolecule that forms a flexible film that locks water out. It contains 50% more polymers than traditional eyeliner. This helps ensure that the liner will be long-lasting and waterproof. Make Up For Ever was kind enough to send me two of the new Aqua Liners to try. I received #1: Diamond Gold which is described as a "sparkling yellow liner" and #5: Diamond Turquoise Blue which is described as a "sparkling turquoise blue". I found that they wore all day long and survived the humidity of N.Y.C. Woot Woot. Have you purchased any aqua liners yet? How did you wear them? Pics! I am always hesitant with really bold color.